There have been so many times in the last couple weeks when I've thought of things I want to talk about or just throw out there for fun. I need to start carrying a little notebook around with me in order to jot them down. I could put them in my PDA/phone, but I'm not so good with the texting even if it is full keyboard. So here's a few semi-random things that I meant to give some time to... aren't you lucky you stopped by today?? 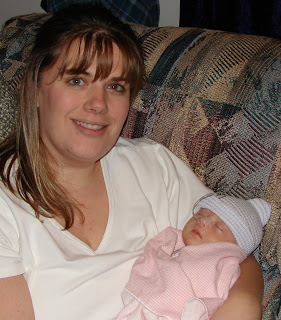 December 14, 2006, the day we brought Braska home from the hospital...finally. Then and now. I hope to try to recreate this pic every year. It's the first one after the day of her birth with she and I together. We've come a LOOOOOOOOOONG way, baby....you and me both. I watched a show last week--I won't mention it or link it because I don't want to even accidentally be blamed for endorsing it--that I normally purposefully avoid even though it's watched in the other living room in our house. I watched it because it advertised having a DS character (this was not the ER episode), and I wanted to see how they dealt with it. I wasn't all that impressed with the actual storyline, but there was an exchange between two characters that I thought was interesting. He said, "What would you do if you had a kid with too many chromosomes?" 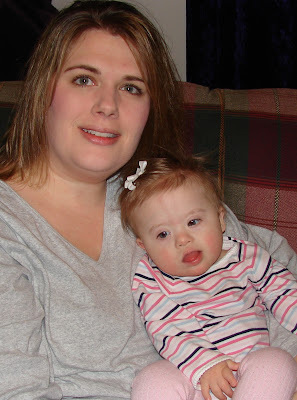 She said, "How do we know that the rest of us aren't just missing a chromosome?" Some things aren't funny. This is something I've been putting together in my mind for some time, and it'll have to wait for further elaboration. But it's important to me...humor is good, laughter is great, but some things just aren't funny and shouldn't be laughed off "just because"...family or not. I've seen so much of that kind of laughing do serious damage to whole lives. On Saturday, 12/15 we joined up with a couple small groups to do some caroling at a couple nursing homes here in town where members of our church reside. I haven't done this in many years, but it used to be part of our family Christmas tradition when I was younger. Granted, we are not actually part of either of these small groups from our church...we're kind of like the honorary small group members who don't actually attend small group. I wish that were different, but baby steps... Our friends are super enough to include us on social occasions so we jumped in. (My husband would say he was more dragged in, really. See his take on the night here.) It was fun to be with our buds again...we don't get together nearly enough anymore. And all the kids were at sitters, so we were fancyfree....well, as fancyfree as you can be on the churchbus visiting elderly and singing Christmas carols. But it was good. It snowed the whole time as we were in the middle of this past weekend's snow storm. It made for a nice setting. 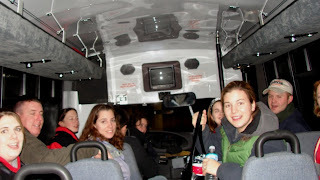 A few pics of the evening...smiles on the bus. 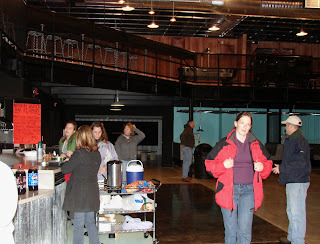 There were goodies and hot cocoa circulating to keep us happy and warm. After we got done, we went back to the church to hang and eat more goodies. We borrowed Oasis, which is the teen auditorium area. It's pretty darn nifty, I say. 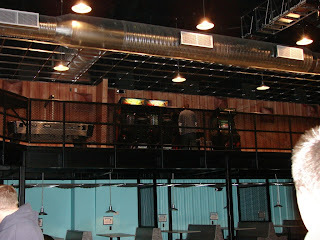 Booths on the side, cafe area, with air hockey, video games, and such on the second level. The girls gabbed as the guys played, for the most part. 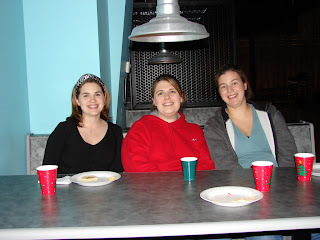 This is Jennifer S, me, and Karen K.
7am--Up, shower, get Braska up and fed, get us both dressed and ready. 7:45am--Leave the house!! Take Belle to the groomer. 8am--Use the time on the north side of town to run errands. Post office to get stamps, Target to return a gift, Wal-Mart to get things we need, gas station to fill up before weekend trip. 9:20am--Return to pick up Belle and head home. 9:30am--Check email, reply to work issues, finish a project. 10am--Freshen up and dress Braska for going out. (Previous outfit was for errands. Pathetic, I know.) Prepare diaper bag and collect Braska's stuff for feeding while we're out. 10:45am--Leave house heading for lunch meeting. 11:10am--Arrive early at the Olive Garden. Make a few phone calls in the car while I have a minute. 11:20am--Go in, get seated, etc. Have nice lunch w/good friend/work contact. Fed Braska while there. (I'm getting used to doing her tube feeding in public. I don't even notice if people look anymore.) Did some business, got caught up, and relaxed a bit over soup and salad. 2:20pm--Arrive home, feeling like I actually got out, and loving it! The rest of the day was a bit less eventful, but that's ok. I got out. I had adult conversation. Man, I miss that something fierce. I didn't do a dish, clean a room, unload the dryer or any of the many other things I needed to do, but I still feel good about the day. While I was out today, getting gas, a guy came out of the convenience store with a brown paper bag, obviously holding one of the tall beer cans. (Yeah, I watch Intervention. That's how I know. Disturbing, yet very enlightening show. I've learned alot of helpful things that I've had a chance to use, but that's for another time.) He gets in his car, closes the door, fiddles around with some stuff, then opens the beer can in plain sight, downs quite a swig, then takes off. I don't like it. Not at all. He is putting my child at risk, and I don't care for it. Target is expensive. While I was there today, I thought I'd use my newly obtained store credit to get the things I had on my Wal-Mart list. So I went to check them out. Now I don't usually know what anything costs. If I need it, I just get it, so I can't tell you how much a pound of meat is or what my deoderant costs or anything like that. BUT I do know what diapers and Braska's liquid food costs. And wow, even the Target generic brand was 15 to 20% more than I pay at WM. All the items I looked at were a few dollars more expensive. I just couldn't do it. Even though it was "free money," I couldn't do it. I didn't think I'd become this person, but I guess I have. Looking at price tags. Guess it's about time. I don't know how all you Target shoppers do it. I think your mind works a little like mine. I'm always thinking of little things I need to add or mention. Having a series of photos each year is a great idea - it's fun to see the difference! oh Target I will willingly pay IF THEY COME TO CANADA PLEEEEEEESE. I admire how Braska gets a new outfit for going out and am very, very glad to hear the tube feeding in public gets better. We are slowly but surely getting there. I hate our pump. hate it. Melissa--I'm so sorry if you're mind is anything as scattered as mine!!! Lisa--Tarjay...love it. That brings back the memories from college. Enjoyed your post. Caroling in nursing homes seems somehow familiar. Glad you got to go. And the facilities at the church are really nice. Love the idea of the annual "pose." Neat to see them side by side. Sounds like one of my posts. I am glad to know I am not the only one who constabtly thinks of things to blog about and forgets later.